Finally a module to add Instagram to your Magento Website! 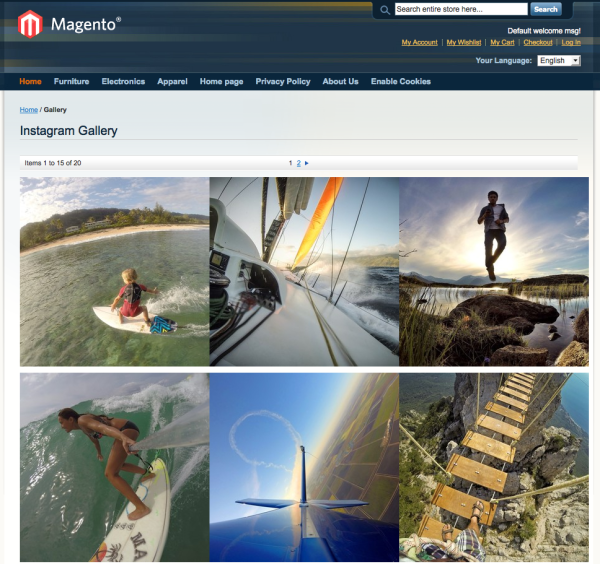 Show Instagram images and video from your feed easily via the Magento Admin area. CDL’s Instagram for Magento module creates a sidebar mini gallery as well as a full gallery page. 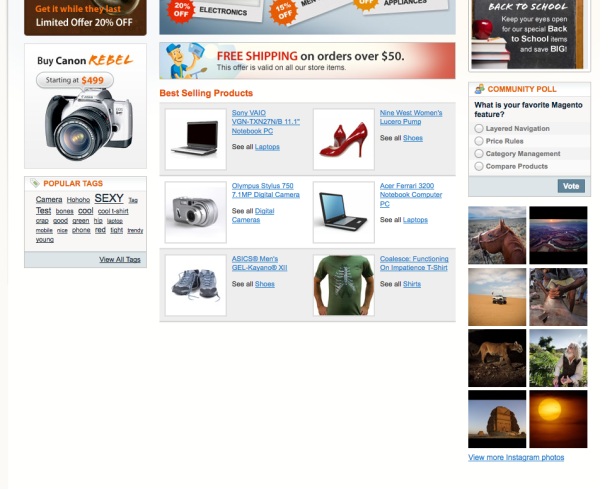 The size of the sidebar images can be adjusted so that you can fine tune them to match your websites design. No coding needed. Full Cache abilities to decrease server load and page load times. 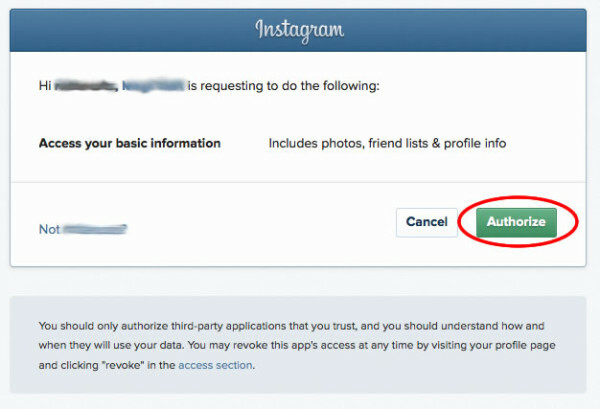 To get these, click the “Get your Instagram Access Token and User ID” button. Click “Authorize”, you will then be taken to a page on this website and shown your Client ID and Access Token. Copy and paste these into your Magento Admin and save the configuration. Please make sure you have Saved the configuration and the steps above BEFORE making changes to these sections. If you did not, no worries, just change the username to something else, save, then change it back and save again. Now that we have the tuff stuff out of the way, it’s time to get to the real settings. Most of these should be pretty self explanatory but I will break it all down for you anyway. Page Title: This is the main title of the page, call it whatever you want. Photos Per Page: How many Images to show on a page, max of 30. Photos Per Row: How many images to show in each row, play with this and the Thumbnail Size option to get the correct look and fit for your website. Thumbnail Size: Instagram delivers 3 image sizes, you get to choose which size you wish to use. Show the Description: Show the images description on the page. This shows up in the sidebar or footer of your website. You can also place this anywhere within your site using the shortcode found in the readme file of module. Thumbnail Size: For the Sidebar this is a pixel size. Play with this number to get the images to fit nicely into your themes sidebar. 92 is perfect for the default Magento theme. Use Lightbox: When set to Yes, clicking on an image will give you the full size image in a lightbox display. Open image in new tab: If Use Lightbox is set to No, this will determine if you want the full size image to load in a new window/tab. Include Lightbox files: If you already have a lightbox working through your theme or other extension then you can set this to No. Custom Lightbox Link class: If using another lightbox/shadowbox then you can provide it’s rel/class link here. By default this extension caches your requests to Instagram to improve loading times and keep our server happy. You can flush/refresh the cache or turn it off completely. Cache Expire Time: The lower the number the quicker the cache will expire, default is 24, set it to 0 to disable the cache completely. Flush Cache: Flush the existing stored cache data. Take a look at your new amazing Instagram feed!